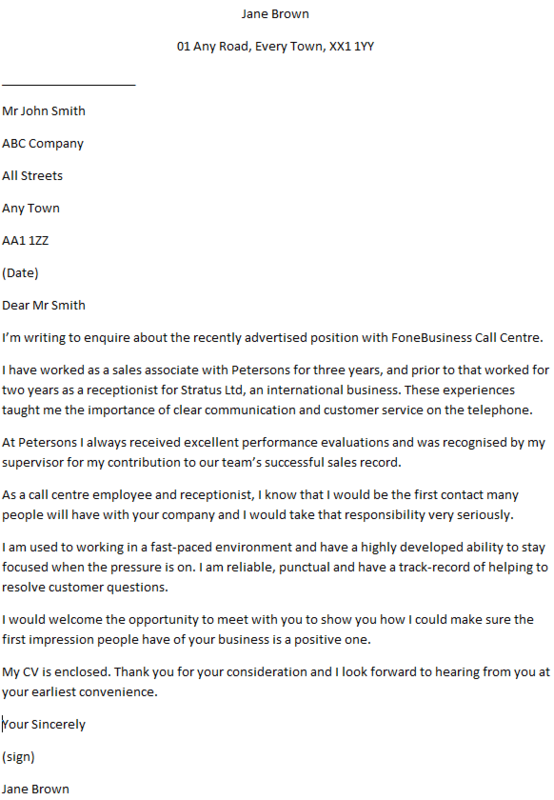 Cover letter example for a Call Centre Operator job. Amend as suitable and use it for your job application. Please find enclosed a copy of my current CV in application for the vacancy for a Call Centre Operator recently advertised on Learnist.org. 2 years experience in a busy working environment as a Call Centre Operator and excellent communications skills with both colleagues and customers makes me an ideal candidate for the job. My previous experience within the retail sector has allowed me to put into practice and improve my time-management skills and given me an insight into the workings of a large retail organisation such as this. I trust that I have provided all the necessary information and look forward to hearing from you in the near future on the above listed contact numbers. Please note I am available for an interview at any time. I’m writing to enquire about the recently advertised position with FoneBusiness Call Centre. I have worked as a sales associate with Petersons for three years, and prior to that worked for two years as a receptionist for Stratus Ltd, an international business. These experiences taught me the importance of clear communication and customer service on the telephone. At Petersons I always received excellent performance evaluations and was recognised by my supervisor for my contribution to our team’s successful sales record. As a call centre employee and receptionist, I know that I would be the first contact many people will have with your company and I would take that responsibility very seriously. I am used to working in a fast-paced environment and have a highly developed ability to stay focused when the pressure is on. I am reliable, punctual and have a track-record of helping to resolve customer questions. I would welcome the opportunity to meet with you to show you how I could make sure the first impression people have of your business is a positive one. My CV is enclosed. Thank you for your consideration and I look forward to hearing from you at your earliest convenience.